Two months after 9/11 the Philadelphia Daily News investigated the Flight 93 saga, highlighting a small unmarked white jet that was seen by many people before, during, and after the Flight 93 crash. THE MYSTERY PLANE. Many people in the Shanksville area, including some interviewed by the Daily News, saw a fast-moving, unmarked small jet fly overhead a very short time after Flight 93 crashed. Since there are no photos of the white jet in Pennsylvania it is best to look at the photos of the white jet flying the skies of NYC on 9/11. The CNN video, America Remembers, caught the Helicopter hoving near the WTC. 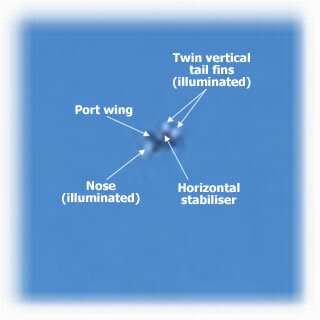 The circled area is an antenna for receiving video from the ST airliner and the two white objects on the bottom of the boom are blade antennas that communicate with the blade antennas on the ST airliner. An operator in the helicopter sits at a monitor viewing video from the airliner and uses the blade antennas to remote control the ST airliner. NOTICE that the helicopter is UNMARKED. 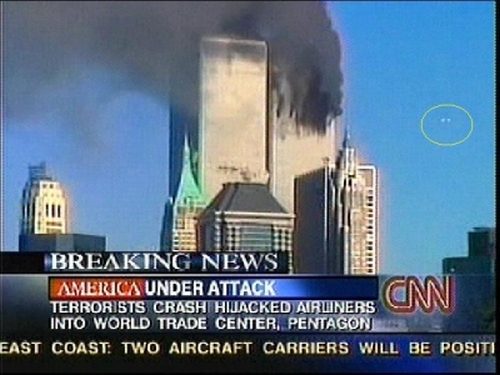 HOWEVER, the remote control station at the North Tower was 'a small white jet'. The white jet flies in-formation right above the airliner so as not to be seen by ground observers BUT CAUGHT BY THE CAMERAS. 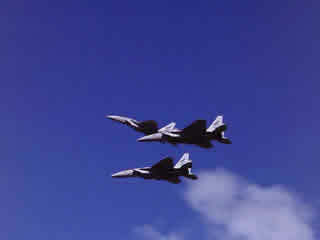 Craig Hill's video, Treason, Inc. (www.hillsenatenow.org) shows the formation flying in slow motion. 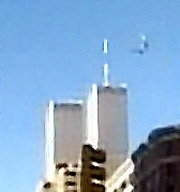 The white jet was caught making a shadow on the North Tower on its ST crash flyby. 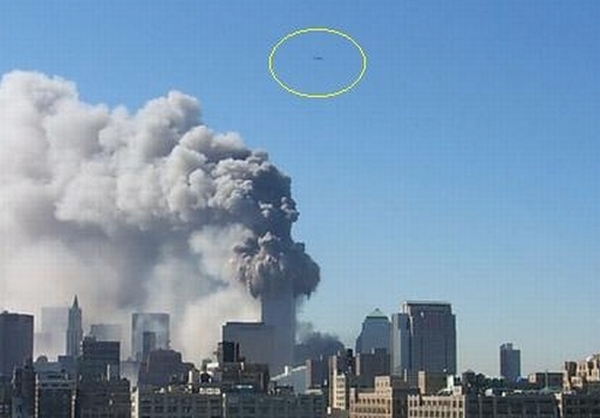 As the North Tower is 208 feet across and the shadow is about 1/6 of that distance, the white jet is about 35 feet long. 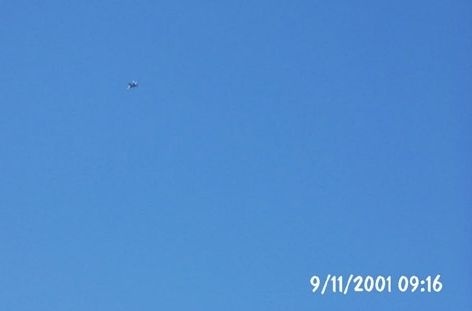 Another camera caught the white jet on its trip to Pennsylvania AFTER its ST crash flyby. 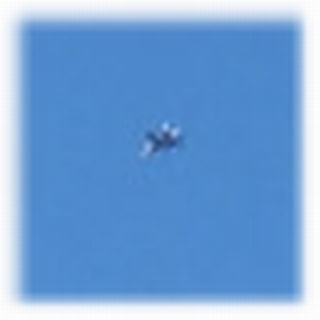 PENNSYLVANIA WITNESSES described the white jet in exacting detail. The Saab 105 SK60 military jet used in the Swedish and Austrian Air Forces fits their descriptions and its 36 foot length fits the shadow made on the North Tower. Of course, the jet had a white paintjob for 9/11 with all markings painted over to hide its identification from ground observers. 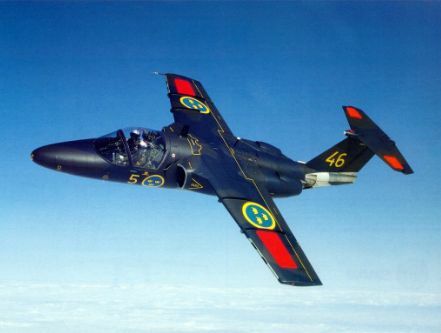 Photos, information of the Saab 105 SK60 military jet. Richard Wallace, US Editor of the THE DAILY MIRROR, shows how the British report the news of Flight 93. 1) Susan Mcelwain: There's no way I imagined this plane - it was so low it was virtually on top of me. It was white with no markings but it was definitely military, it just had that look. "Then they changed their story and tried to say it was a plane taking pictures of the crash 3,000ft up. "But I saw it and it was there before the crash and it was 40 feet above my head. They did not want my story - nobody here did." The FBI's later explanation for the white jet was that a passing civilian Fairchild Falcon 20 jet was asked to descend from 34,000ft to 5,000ft some minutes after the crash to give co-ordinates for the site. The plane and pilot have never been produced or identified. Susan Mcelwain says a Falcon 20 was not the plane she saw. 2) Lee Purbaugh: There was another plane," Lee said. "I didn't get a good look but it was white and it circled the area about twice and then it flew off over the horizon." 3) Tom Spinelli: "I saw the white plane," "It was flying around all over the place like it was looking for something. I saw it before and after the crash." 4) Dennis Decker, 5) Rick Chaney: About a mile north on Buckstown Road, Dennis Decker and Rick Chaney were at work making wooden pallets when they heard an explosion and came running outside to watch a large mushroom cloud spreading over the ridge." As soon as we looked up, we saw a midsized jet flying low and fast," Decker said. "It appeared to make a loop or part of a circle, and then it turned fast and headed out. " Decker and Chaney described the plane as a Lear-jet type, with engines mounted near the tail and painted white with no identifying markings. "If you were here to see it, you'd have no doubt," Decker said. "It was a jet plane, and it had to be flying real close when that 757 went down. If I was the FBI, I'd find out who was driving that plane. " 6) Robin Doppstadt: Robin Doppstadt was working inside her family food-and-supply store when she heard the crash. When she went outside, she said, she saw a small white jet that looked like it was making a single circle over the crash site. "Then it climbed very quickly and took off. " "Everybody's seen this thing in the sky, but no one can tell us what it is." 8) Jim Brant: Mr. Brant and two of his employees arrived at the site in minutes , hoping to help survivors. He said he noticed a white plane, perhaps a jet, circling the wreckage. "It reminded me of a fighter jet," he said. He said it stayed there for one or two minutes before leaving. "The plane had no markings on it, either civilian or military." 9) John Feegle: "It didn't look like a commercial plane," Feegle said. "It had a real goofy tail on it, like a high tail. It circled around, and it was gone." "The aircraft appeared to have an unusually tall vertical stabilizer." 10) Kathy Blades and her son ran outside after the crash and saw the jet, with sleek back wings and an angled cockpit, race overhead. The US version is also all white, but has an air force star in the rear quarters. The major difference is it looks like the paint pattern on top is reversed in the blow-up. It doesn't look anything like the Saab 105 at all from what I can tell. "Well, the - I suppose the toughest decision was this question of whether or not we would intercept incoming commercial aircraft. MR. RUSSERT: And you decided? VICE PRES. CHENEY: We decided to do it. We'd, in effect, put a flying combat air patrol up over the city; F-16s with an AWACS, which is an airborne radar system, and tanker support so they could stay up a long time." My feeling is wherever the blown-up images came from they are not related to what happened in Pennsylvania. It is also understandable that there would be other aircraft showing up in footage of the WTC since there was a gap before all jets were told to land. It was business as usual in the skies before the government and FAA caught on. The towers are close to JFK and LaGuardia - two major airports in New York. The air traffic pattern is right along side the towers when you land, right past Ellis Island. I always try to keep an open mind when I read the articles on your site and sometimes I find some great insight. But once again I have come across a conspiracy theorist article that is just absurd. My office is in Midtown Manhattan facing south. I am on the 36th floor and had an unobstructed view of the first airliner crashing into the North Tower. I watched the entire flight of the jet down the length of the island after it went roaring right over my own office building. There were no other aircraft in the sky over midtown or downtown Manhattan when the aircraft struck the North Tower. There was no white jet, there was no helicopter anywhere in the vicinity. I can remember every detail of every second of that day [down to the conversation I had on Queens Blvd as I walked home with a guy that would have been in the North Tower if it wasn't for his dentist appointment, and the amazing sight of military fighters refueling over Manhattan after the towers had fallen and I had begun my 3.5 hour walk home], and probably will for my whole life. These claims by paranoid guys sitting in towns that face no real threat, who believe they have figured it all out drive me crazy. Yes, I understand that they are free to write what they wish, and that there may even be a benefit to having them place their opinions out there for everyone to read and consider, but does any vetting of this material take place? For instance, where are the ATC [air traffic control] transcripts that would show that such aircraft were in the air -- or at least a denial of an appropriate FOIA request? Where is there actual documented proof that the antenna identified on the helicopter is 1) the type of antenna that would be used with a remote control system and 2) was actually hooked up to a remote control system. All we are provided with is some guy, whose CV is completely unknown and not disclosed, circling a part of the undercarriage of a police helicopter and declaring it was part of a remote control system. What is the efficacy of providing a media outlet to such absurd and ill conceived hyperbole? Incidentally, that is not an unmarked helicopter we see in the pictures. 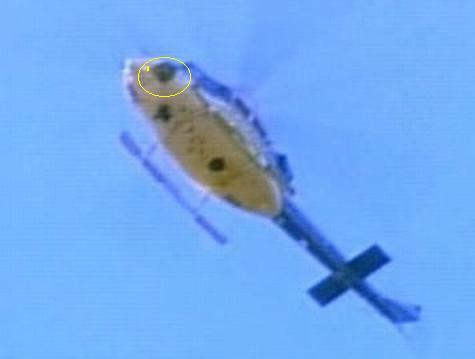 First it is a poor quality picture of the belly of a helicopter, so it would be hard to see markings in any event. However, it can clearly be seen that the helicopter is painted in the blue and white livery of the NYPD and is of a type of helicopter that is seen almost daily flying over the city. Has the author of the article ever even been to New York? I have yet to see an article on this site surrounding the events of 9/11 that is carefully reasoned and properly documented. Time and time again I read articles in which the author latches onto some intriguing factoid [usually unsubstantiated], and then using it as a starting point, they begin piecing together an entire theory of how 9/11 was a staged and orchestrated event by anyone from the illuminati to Bush himself. Half the crowd says the Towers were blown up based on pictures of the structure collapsing[even though if you watched the towers burn then fall like I did, it was obvious that the structural steel melted causing the collapse -- hell my exact words 20 minutes before the collapse of the north tower as I Watched the fire through binoculars spreading DOWNWARDS [think heavy jet fuel] through the building was that the steel was going to melt and the building would collapse -- 20 minutes later it did just that]...the other half are latching onto this remote controlled theory. I was there. I saw it, I lived it, talk to me, visit the city and understand the layout so you understand why you are missing about 50,000 witnesses to the white jet and helicopter theory. It didn't happen the way these guys are claiming it did. Which then raises the question why are these guys coming up with bullsh-t theories? I suppose in most cases its because they like to hear themselves talk and like to feel important because they figured out what no one else did, but does that explain all of them. If you are looking for a conspiracy, examine the conspiracy theorists for a change. For comparison here is a photo of 3 F-15's (1) ­ note the similarity in lighting and shadow effects that accentuate the nose and twin vertical tail fins. With extrapolation of altitude and angle the similarities are apparent.